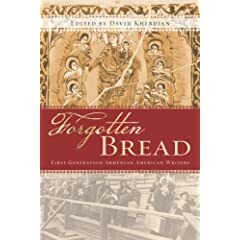 Forgotten Bread is a wonderful collection of poems, novel excerpts and short stories from some of the most famous first generation Armenian-American authors in the United States, complied and edited by David Kherdian. I find that usually when I mention Armenian literature, most people tend to think of William Saroyan. Although most of his work has permeated into modern society, (Come on-a my house my house – theme song for E!’s Girls Next Door), William Saroyan is not the only Armenian to garner an illustrious career, a much coveted education, and various levels or reputation in the States. This collection includes snippets by seventeen first generation authors, preluded by seventeen introductions from second generation Armenian-American authors gives a valuable insight into the Armenian mind-frame and world. One of the most constant and steady themes I recognized in each selection was a sense of loneliness, alienation and a desperate search for identity and stability. In the crux of the Middle East, Armenia is a country that belongs to the world, but is still orphaned by tragedy throughout its history. Armenia is in the middle between western civilization and Middle Eastern mentalities. The lone Christian populous in an Islamic regime. Despite the various conquests, and the Genocide of 1915 by the Turkish government, Armenians have managed to survive. We have diluted ourselves throughout the world, sharing our stories, drinking our teas and reminiscing over the past. Armenian story-telling is not superficial, and it is not overly dramatic. Armenian storytelling is an honest and raw look into the human psyche. Many of the authors in this selection write about their lives, write about their losses, or create characters that can better explain the author’s sense of being. My favorite work was the poetry of Majorie Housepian and the short stories of Leon Surmelian. Both hit a nerve with me, in terms of merging Armenian traditions with American lifestyle, a struggle is never easy, no matter what the decade. This book will be a welcome addition to any Armenian household, introducing new authors, providing stories from those already well known. I think other cultures would enjoy this book, to take a look into the lives of a forgotten nation. This entry was posted in Adult Fiction, Books, life and tagged Armenia, Armenian authors. Bookmark the permalink. Holy cow! This is a must have for me! I have never heard of this collection, but I am definitely going to try to find it. First place I will go look today right after work is the English bookshop here in Yerevan (I guess now you understand my exclamation at the beginning of this comment 😉 ). They have a limited collection of books, but tend to be fairly well sorted in Armenia-related books. If they don’t have it, I’ll see if I can order it somewhere. Haha, I’m glad I could make your day! This is a great collection of Armenian work, I’m sure you’ll enjoy it as soon as you can get your hands on it! Good luck! I enjoyed your writing style and I’ve added you to my Reader. Keep these posts coming.